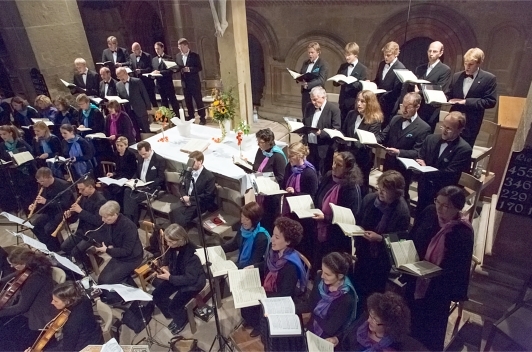 Ensemble il capriccio (Baroque Orchestra) and the Maulbronn Chamber Choir. Music Director / Conductor: Jürgen Budday. DDD · Total Playing Time: c. 163 Minutes / 2h.43m. 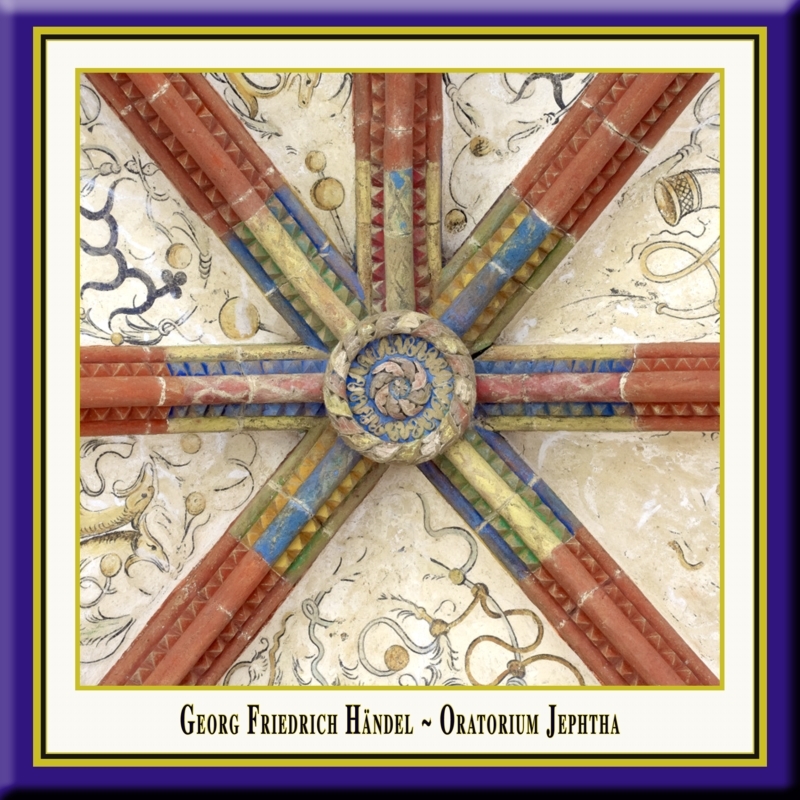 his live recording is part of a cycle of oratorios and masses, performed in the basilica of Maulbronn Abbey under the direction of Jürgen Budday. The series combines authentically performed oratorios and masses with the optimal acoustics and atmosphere of this unique monastic church. This ideal location demands the transparency of playing and the interpretive unveiling of the rhetoric intimations of the composition, which is especially aided by the historically informed performance. The music is exclusively performed on reconstructed historical instruments, tuned in the pitch, which was customary during the composer's lifetime (this performance is tuned in a' = 415 Hz). ephta was Handel's last work of great dimensions. It was written in 1751 in London. It was performed for the first time at Covent Garden at february, 26. in 1752. Händel's last dramatical work was in the same time the most poetic of his oratories. The tension is not created by action but by the inner aspect of Jephta's unsolvible solitude. Expelled from Gilead by his half-brothers, he grows up in exile and becomes a godfearing army commander, while Gilead is suppressed by the Ammonites. After 18 years of slavery, the eldest of Gilead ask Jephta to free them from their tyrants. As army commander, Jephta swears his god Jehova to sacrifice to him the first creature he will meet after victory. He can't see that it's his own daughter Iphis to take this burdon upon her shoulders. The desperation of Jephta, mother Storge and lover Hamor is met by the courage of Iphis, who comes to show herself as a true heroine. The tragical conflict of the sacrifice of his own daughter is turned to a good end, inspite of the outlines of the old testament. The music is of an overwhelming forcefulness and beauty. Jephta's importance is based in the first place on the imposing choir scenes. The choir has double function: at one hand he takes part in action actively, on the other hand he stays in the backround and comments on the story. Jephtha is the illegitimate son of the Israelite leader, Gilead. On Gilead's death (over eighteen years before the action begins) Jephtha was scorned and thrown out of Israel by his half-brothers. He has been living in Tob with his wife, Storgè, and their daughter, Iphis, who was born in exile. Soon after Jephtha's exile the Ammonites attacked Israel and began a long and bitter war. The Israelites have been at war with the Ammonites for the past eighteen years. All their military leaders have been killed, and the people have begun to turn away from Jehovah and worship false gods. In desperation they ask the exiled Jephtha to return and lead their forces in a final offensive against the Ammonite occupation. Jephtha agrees to lead the army on condition that he is allowed to lead the country if he wins the battle. The Israelites, led by Jephtha's half‑brother, Zebul, agree to his demand. He says goodbye to his wife and daughter. Iphis then says goodbye to the Israelite, Hamor, to whom she is engaged and who will fight alongside her father in the forthcoming battle. Jephtha is worried about the outcome of the battle and privately makes a deal with God: if he returns victorious, he will sacrifice the first living thing that he sees on his return. Meanwhile his wife is afraid that some misfortune will happen, and is comforted after a nightmare by her daughter and servants. Jephtha, who has failed to secure a peace by treaty, prepares his Israelite forces for the battle. Hamor informs Iphis of her father's victory, and describes the miracle of the battle, in which an army of angels signalled the enemy's defeat. She asks her servants to prepare to welcome her father back. Jephtha returns triumphant and commends the bravery of his officers, Zebul and Hamor, but says that God deserves the real credit for the victory. Iphis then appears unexpectedly to greet her father with her servants. Jephtha is horrified to realize that it his daughter who is the subject of his rash promise to God. He is forced to tell everyone of his vow, and all try to persuade him to change his mind. He refuses. Iphis herself convinces him that she will go ahead with the with the sacrifice for the sake of her country and family. The community wrestles with the nature of the goodness of a God who asks for the murder of a child. Jephtha, his wife and the community prepare for Iphis's sacrifice. She is very frightened and says goodbye to everyone. The whole community appeals to God for guidance. Just as Iphis is being dragged off to her death an angel appears and forbids the sacrifice to proceed: Iphis must dedicate herself to a life of chastity and the service of God. Jephtha and the community thank God for sparing Iphis's life. Storgè and her servants prepare for Iphis to leave. lphis and Hamor say a final goodbye to each other. Everyone tries their best to rejoice at the happy and strange end to their troubles, and the peace which Jephtha's military leadership has secured.